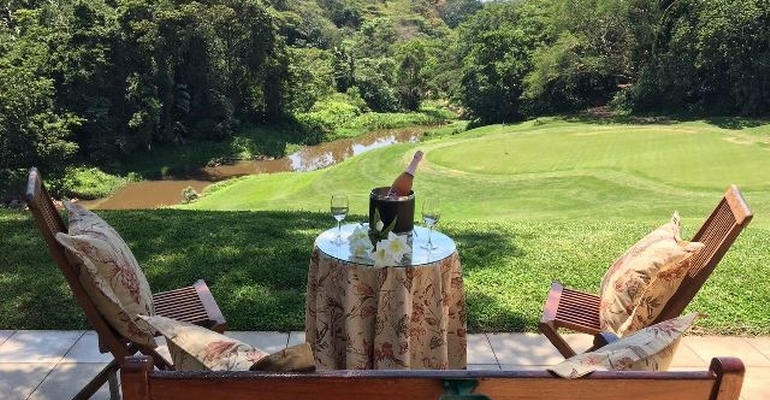 Fanlingerers is a magnificent privately owned holiday villa in Selborne Park Golf Estate, which was originally designed on the back of an empty box by four friends one evening after a wonderful game of golf at Fanling. Putting their dream into action, the villa was built and then named in memory of happy days in Hong Kong and Fanling - a token to the original Fanlingerers established in 1951. Overlooking the 4th green of the Golf Estate, Fanlingerers enjoys beautiful views of the Estate from the open front patio. At the side of the house is an undercover veranda with a built-in braai and outdoor dining suit. A beautifully decorated and fully furnished open plan lounge area has large windows which allow for plenty of south coast sunshine to enter the living area and leads out to the patio. The dining room has a six seater dining table. The fully equipped kitchen with modern appliances, including fridge / freezer, microwave, washing machine and dishwasher, makes for easy self-catering on all occasions. Central to the living area of the villa is the bar which is the heart of the home - a place where friends and family can gather together and celebrate. This gorgeous villa has four bedrooms each with its own en-suite bathroom and can cater for up to 8 guests. A daily cleaning service ensures guests can relax and enjoy their holiday and a laundry service is available should it be required (additional fee). Upon arrival guests staying at Fanlingerers will be issued access to the Private Beach Club (no additional costs) and are welcomed to enjoy the Estate’s Golf Course, Tennis Courts, Restaurants and other facilities (additional fees apply).